Its surprising that barely within radius of 1km from the KK international airport the people of Meanwood Vorna Valley lives a nightmare of 16th century roads. The thief Robison Zulu (owner of Meanwood property ltd) was busy giving Chief Mpezeni cheques ahead of Chipata central by- election, after he swindled the people in Meanwood airport housing project who bought plots as he had stated in contract of sale that he will construct all weather roads. The area MP Silvia Masebo came with as usual Pf-Bufi that they will put gravel on the main roads, but as usual it was Pf Bufi at work. Our children can’t go to school as some of us with Sedan cars are completely cut from the civilised Lusaka. The whole area is swampy and slippery with clay soil. 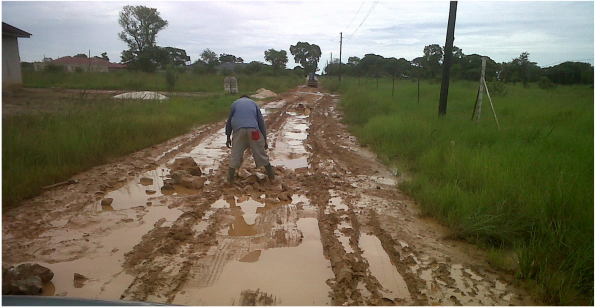 The ZNS all they know well is shooting poor people when the same road demarcates their camp in Kampasa, while the graders are just packed which can help to gravel the road. If the government can’t declare this situation as a disaster then we are in serious problem!